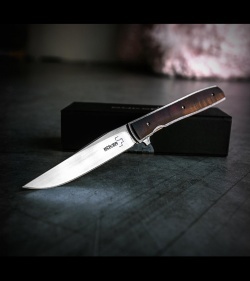 Designed by Brad Zinker, the Urban Trapper is inspired by classic Trapper knives and has become one of Boker's most popular gentleman's knives. It's an appealing knife with a slim build and high-grade materials. 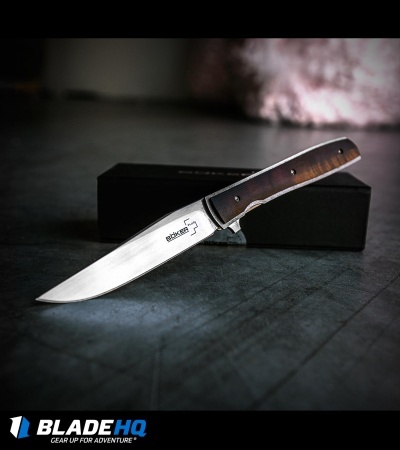 The premium VG-10 stainless steel clip point blade rides on an IKBS ball-bearing pivot for smooth, no-nonsense action and this model of the Urban Trapper features a cocobolo wood handle with a titanium frame lock and a deep carry pocket clip. This is a strikingly beautiful knife, in materials and finish, and its graceful lines. It is thin, light, and delicate--you could probably break it with your bare hands. It's a gentleman's knife, so be gentle, man. The pivot on this knife has torx head slots on both sides, but it is, in reality only a single sided pivot with the lock bar side being immobile via a D-shaped pivot race. But it has a torx head so what happens? You break the knife. Ridiculously poor decision that. Other than that, this one shipped to me with the side of the blade contacting the liner. I had to pull it apart and fix that before ai could do anything else. That's how ai learned about the looks double sided but isn't pivot. 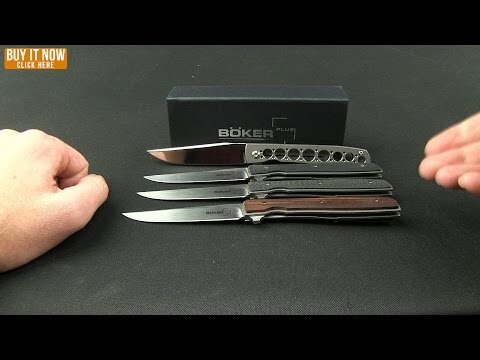 Definitely wont be buying another boker product if they let this one out the door. I have notice when grip knife in open position your index finger pushes on liner lock opening it. It flexes with slightest pressure. It makes it quite dangerous in use. It looks beautiful but it is poorly designed. I would return it if I could but I have serious hospital issue so it too late. Do not buy it. Also only spacer the whole length of a long knife. Shame I can't send it back. Feels great in the hand; hard to just leave it alone in my pocket. Colors go well together: nice wood, aged looking titanium frame and satin blade. Lock has a good bit of grind against the blade when un-locki. I hope it soon goes away. Point is sharp, but edge is dull. No problem to fix. This is one of my most carried knife. It's has 3.5" of cutting edge but feather-weighted. Along with the deep-carry clip, it's hard not to pick this knife in the office. It's also great for food prep. The build quality, however, isn't perfect. It's hard to get the blade centered. If I want it to flip well (btw it flips like a dream), the blade would get too close to one side of the scales. I already have scratch marks on my blade from contacting the scale. This knife is absolutely beautiful. I love the wood scales and the deep carry pocket. When you press the flipper tab the knife opens so smoothly, not quite snappy but it just glides open. As a knife nut I had to pick up this Brad zinker designed boker just for the looks alone. It's a good knife but has a few issues. The flipper tab is a push button only style flipper which takes some getting use to. Not a hard use type of knife so don't buy it for that. 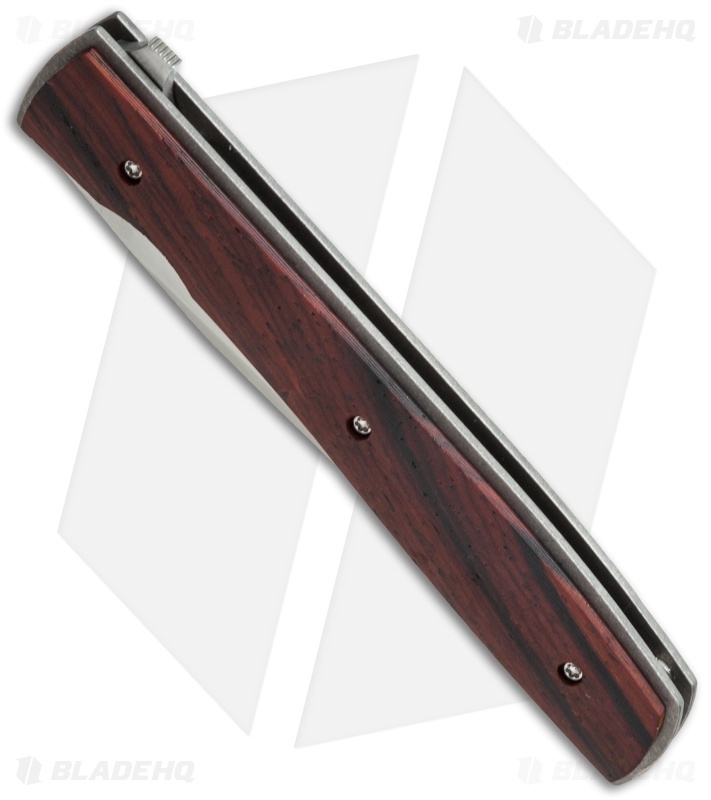 Overall this knife still gets 4 stars because it's a good knife. I carry this in the office and it doesn't scare anyone and it does its job well. However when I got to go out on calls for work I always switch to a stronger knife. Again still a good knife just know what you're gonna use it for before you buy. 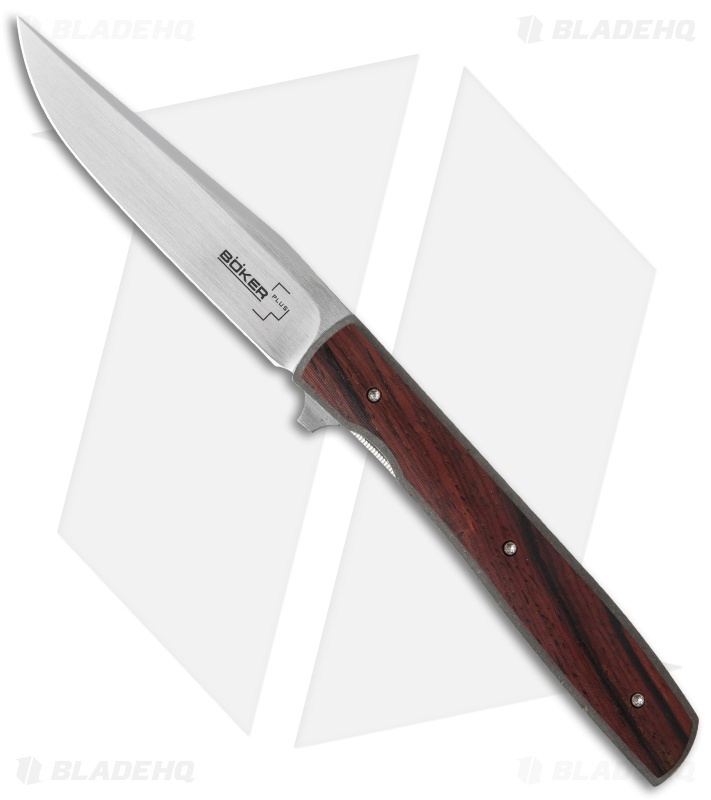 The Urban Trapper looks great especially in the cocobolo wood scale. 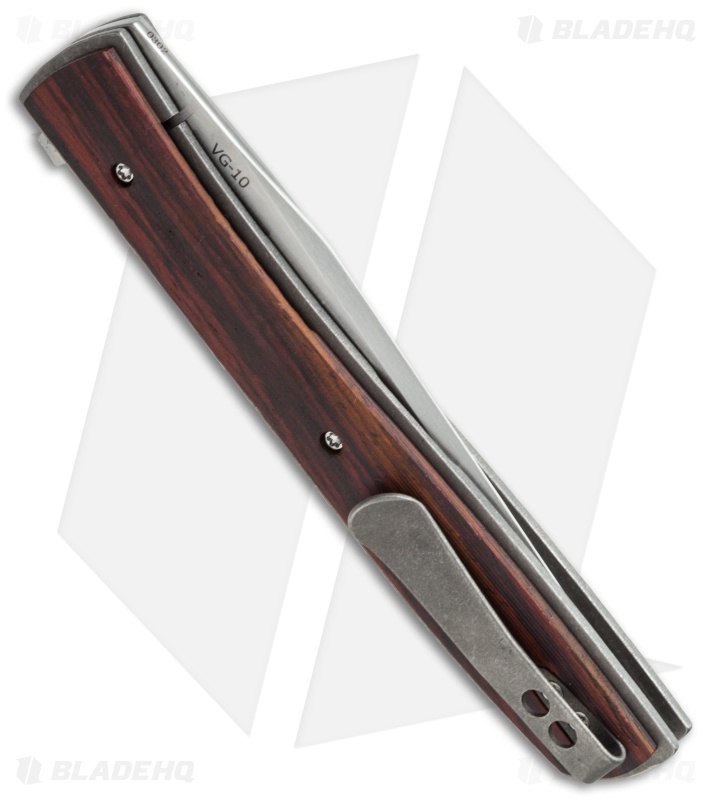 The long clip point blade is functional and gorgeous. It has a nice deep carry clip and weighs practically nothing. However it did not come very sharp and it does have some lock stick/lock rock issues. One of the best I've ever bought for EDC. Long blade and handle, yet super light weight. Better than my Al Mar. Opens with a flip. Looks "gentlemanly," not tactical. You can carry it most anywhere. I am bummed I didn't buy this from blade hq because I would have saved 20 bucks. I love this knife so much that it is my main edc knife. It surprised me, lightweight but very strong. I forget that it is in my pocket. I have had it for a month now and I honestly have zero complaints. Everyone I show this knife too wants one. I will definitely be buying more these but from blade hq as they have a better deal and Blade hqs service is better than Amazons.